How much does it cost to travel to Lithuania? How much money will you need in Lithuania? €67 ($75) is the average daily price for traveling in Lithuania. The average price of food for one day is €27 ($30). The average price of a hotel for a couple is €65 ($73). Additional pricing is in the table below. These average travel prices have been collected from other travelers to help you plan your own travel budget. How much money do I need for Lithuania? Lithuania, although a very small country, has much to offer. From the old world charm of its capital city, Vilnius, to the beautiful, rural, coastline around Nida, you can really relax and make yourself at home in this quaint country. It is a small Baltic country in Northern Europe that touches the Baltic Sea to the west and Lativa to the North. It is also bordered by Belarus, Poland and Russia (Kaliningrad). Lithuania can be divided into five different regions which have their own unique differences and personalities. Aukstaitija is in the northeast and has highlands and natural beauty. Zemaitija is in the northwest and offers a fascinating culture as well as the Hill of Crosses. The capital city of Vilnius is located in Dzukija, which is to the south and Suduva is to the southwest. Lithuania Minor is along the coastline and offers impressive sand dunes and coastal towns. Given its small size, the country has a lot to offer visitors. There are many religiously significant sites that attract pilgrims from all over the world. There are also impressive natural settings, quaint small towns, and vibrant cities and university towns that provide fun settings in which you can relax. There are plenty of places to go if you enjoy shopping in Lithuania. There are many different shopping centers around and on weekends you may find some open air markets. Gariunai is the Baltic's largest open air market and it is found just to the west of Vilnius. There are many different vendors there from not only Lithuania but also countries as far away as the Ukraine. Basketball is a favorite sport among many Lithuanians. It makes up an interesting part of the country's history and has always been a source of national pride. They are a basketball powerhouse and if the opportunity presents itself to attend a game, this can be a fun and unique experience. Prices in Lithuania are low compared to Western Europe and even some countries in Eastern Europe. Train travel is a popular option and tickets are much more affordable than they are in Western Europe. Litrail provides service to the major cities and they offer both seating and sleeping cars, although most trips are relatively short. Buses are a convenient way to travel around the country. They stop frequently so trips may take longer than you originally anticipate. There are several different companies of varying quality that offer travel between the cities. Inquire into the reliability of and efficiency of the bus company before you purchase tickets. The official language of Lithuania is Lithuanian. Russian is a common second language and about eighty percent of the the population speaks it. The younger population is learning English more frequently but it still remains uncommon. Some people also speak German. Accommodation throughout Lithuania can vary dramatically in price and style. It remains cheaper than accommodation in Western Europe and if you travel during the low or shoulder seasons you will save even more money. In smaller towns and rural areas it may be difficult to find accommodation during the winter months as they generally expect few tourists during those times. Lithuania has an interesting history and culture of which they take much pride. Make a point of visiting the small towns, wooden churches, and quaint settings so that you can fully appreciate this culture. If there are local festivals going on, then these present the perfect opportunity to fully experience the everything that this country and its friendly people have to offer. Hill of Crosses: The Hill of Crosses is located just a few kilometers from the city of Siauliai. 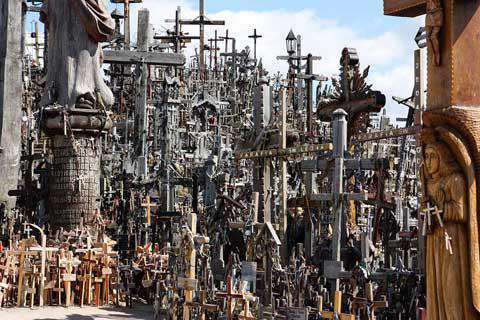 This is an impressive pilgrimage site that has more than 100,000 crosses of all sizes. Each cross has been put on the hill by religious pilgrims who have made the trip. Curonian Split: This World Heritage Site divides the Curonian Lagoon and the Baltic Sea. It is also shared by both Russia and Lithuania and can be reached from the city of Klaipeda. People visit the area for its coastal feel and the impressive sand dunes. Aukstaitija National Park: This is one of the most popular national parks in the country. In it you will find elk, deer and wild boar as well as many plants and birds that are endangered. There are also 126 lakes and numerous streams that make this a great place for water sports when the weather is appropriate. Lithuanian cuisine is hearty in nature, in part due to the area's cold climate. It features items typical of a cold environment such as barley, potatoes, rye, beets, greens, berries, and mushrooms. Dairy products are also popular throughout the country. The food is similar to that found in other Eastern European countries, but there is a unique, local twist on most dishes. Kugelis: This Lithuanian dish is a potato pudding that is made from grated potatoes and eggs. It is served with sour cream and spirgai. Blynai: Although blynai are often described as pancakes, they are usually more similar to crepes because they are quite thin and are often mixed with fillings such as apples, potato, meat, or mushrooms. They can be either sweet or savory in nature. Koldunai: These are a variation of Lithuanian dumplings. They are generally filled with things such as minced meat, sausage, cottage cheese or mushrooms and can be topped with crumbled bacon. They are similar to Polish pierogi but smaller in size. If you're looking for cheaper prices in Lithuania (or anywhere in the Baltics), travel during the shoulder season. If you can handle the weather being slightly cooler than in the summer (it's really not that bad in the spring), then you can save up to half off of normal summer hotel prices. Everything from luxury hotels to cheap hostels are are a bargain in spring and autumn.